Thanks to thorough investigative reporting it has now been uncovered that the Trump administration's international collusion did not stop with Russia, nor did it consist of a small gang of White House insiders. What makes it even more shocking is the fact that this criminal operation is being conducted out in the open, with safe houses flying the US flag and employees on official US government payroll. The members of this shady organisation meet with foreign dignitaries on a regular basis. Notes about these talks are even made public. 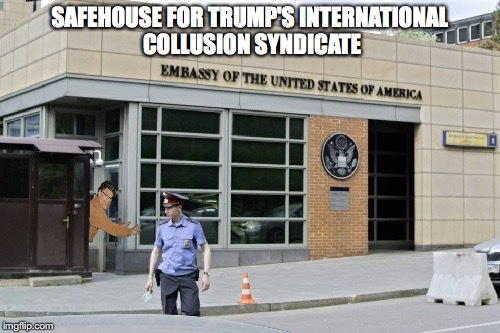 Foreign safehouse for Trump's international collusion syndicate. It is not yet clear since when this collusion enterprise has been in operation, but the Clinton Foundation (an organisation dedicated to fighting foreign influence in the USA) suggests that it may have started even before Trump's election. The question is now no longer if POTUS 45 will be impeached, but when. It's even worse than "just" those safehouses! Komrades, see Trump's sinister bunker of influence planted just two miles away from Munich Kubicle - Amerikahaus München! Note the menacingly ginormous antenna, disguised as "Obelisk am Karolinenplatz"! Visit that spooky hellhole and give them an Antifada progjob! Often seen in Amerikahaus München, too! But when Gropey Strangey is out of Munich (Kremlin called! ), things go nicely and smooth here. Avalon Hill is going to change the name of Diplomacy. This image (below) of the Obelisk was taken through a special hybrid lens coated with synthetic bi-polymer macromolecular isotopic flavor enhancers and pure spring water. It clearly shows the wire and insulator elements typically found in HAARP arrays. Holy Crap(-Tech)! Now it's all clear, like macromolecularly isotopized spring water optics. Yes, but ze... whole point of the BA Station... is lost... IF YOU KEEP IT A SECRET! Vhy didn't you tell ze world, eh? OK, Komrades - start Google Earth*, enter 47°51'28.00'' N 12°00'08.55''E . 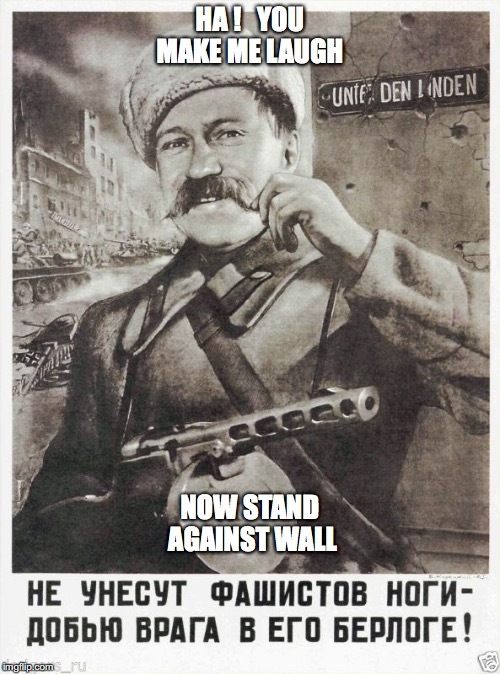 * Komrade! Ask not what your Googoebbels can do to you, ask what you can see through your Googoebbels. BA Station... Int'l collusion network inside US State Dept? NSA involved? Jawohl! Steve Bannon (in disguise, of course) receives transmissions from Bad Aibling Station. As soon as BAS returns the receiver to its cradle, Mr. Bannon runs to Mar-a-Lago and reports. DOD Filters Its Network - Can Yours Be Far Behind?